This week Nathaniel over at Film Experience has given me a near impossible task. I have to pick a favorite shot from either To Kill a Mockingbird or Roman Holiday- 2 of my favorite movies of all time! I actually saw Roman Holiday on the big screen in December and To Kill a Mockingbird last month so they are fresh on my mind. They are both near-perfect examples of their genres and that is in no small part because of their tremendous leading man Gregory Peck (he would be 100 this week hence the Sophie’s Choice we are given…). I have already done a character study of Atticus on this blog where I break down why he is such a compelling character. You can read that here. I also reviewed Roman Holiday previously on my youtube channel. https://www.youtube.com/watch?v=nVuSFzTJgVE. Anyway, I decided to go with To Kill a Mockingbird because as great as I think Roman Holiday is, it’s Audrey’s movie. To Kill a Mockingbird rises on the wings of Gregory Peck’s great performance. It takes one of the greatest novels and makes one of the greatest movies ever made. Someone asked me if I could have lunch with a fictional character who would it be? My answer is Atticus Finch. The reason is I feel I could learn something about being a better human being from him. He is such an honorable man and is willing to fight a battle he knows he is going to lose. But he is also not a martyr to a cause or principle. He’s just doing the task the world called upon him to do in the best way he knows how. ‘stand up, your father’s passin’. For me, one of the great scenes of cinema or literature. Perfection. What is your favorite scene of To Kill a Mockingbird? Share your thoughts in comments section. Thanks! Happy 100th Bday to Gregory Peck! I havta see this movie again to discuss a favorite scene. I really loved this film when I first watched it last year. 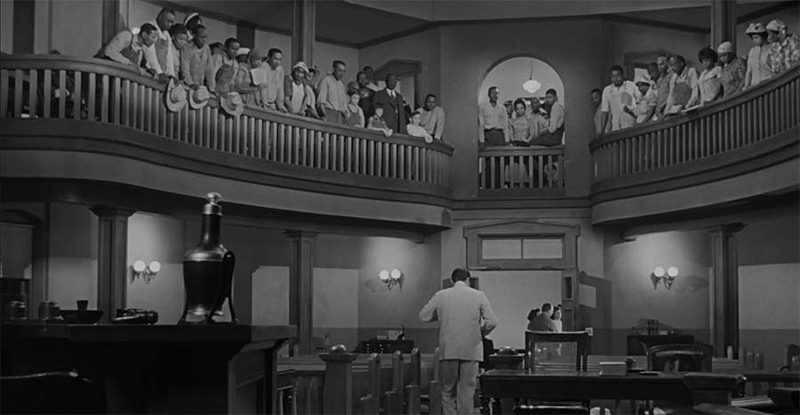 Pretty much the whole time spent in the courtroom is fantastic due to the quality of the acting, but Atticus’s closing statement was probably my favourite part. Yeah that closing argument is perfect. You just feel him begging them to do the right thing knowing they wont. I love this movie so much.